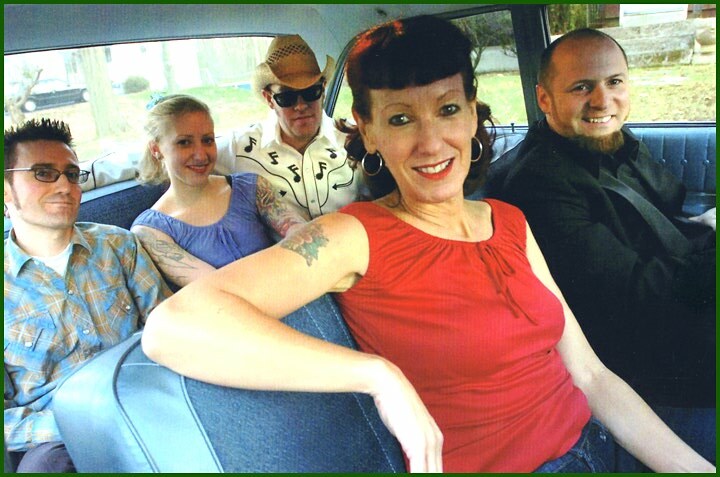 Spinout Recording Artists, THE STUMBLEWEEDS play classic country and rockabilly music and are based out of Boston, MA. U.S.A. Featuring the powerhouse female vocals of Lynnette Lenker and backing vocals by Lisa Beauregard. With red-hot playing from the best: Dennis Kelly on lead guitar, Jack Hanlon slapping dog house bass, and Johnny "Cocktail" Cote. The Stumbleweeds' debut full-length, 12 song CD, entitled "Pickin' and Sinnin'", was released in Spring 2001 on the Rawk Records label. The CD has 9 great originals and 3 lesser-known vintage covers. "Pickin' and Sinnin'", was distributed by Hepcat Records and was Hepcat's "Pick of the Month" for many months. The CD has received rave reviews and loads of radio play in the U.S. and Europe, receiving top air play on many roots radio shows. The CD charted #16 on the FAR radio chart (Freeform American Roots chart), and affiliation of approximately 100 roots radio DJs in the U.S., Canada and Europe. The band will release their second CD called, "Evil on Your Mind", in mid-April 2006 on the label, Spinout Records! The CD has 15 tracks with 6 brand new originals and 9 hand-picked vintage covers. The Stumbleweeds have played with many greats: Wanda Jackson, Janis Martin, Marti Brom, Junior Brown, Kim Lenz, Big Sandy, Wild Fire Willie, Asleep at the Wheel, and The Two Timin' Three, to name a few. 2001, released Debut CD, "Pickin' and Sinnin'", Rawk Records. 2001, 1 original song on The Official Viva Las Vegas 4 Compilation, No Hit Records. 2002, 1 original song on The Officail Viva Las Vegas 5 Compilation, No Hit Records. 2002, 1 original song on All I Want for Christmas, Dusty Records, Sweden. 2003, 2 original songs on Live at the Road Agents Rockabilly Rumble '02, Canted Quad Records. 2006, second CD due out in Winter! April 2001: Viva Las Vegas 4 Rockabilly Weekender, Las Vegas, NV. April 2002: Main Stage, Viva Las Vegas 5 Rockabilly Weekender, Las Vegas, NV. July 2002: Road Agents Rockabilly Rumble and Car Show, East Haven, CT.
September 2002: The Big "B" Jamboree, Cleveland, OH. April 2005: Oneida Casino's Rockin' 50s Fest II, Green Bay, WI. May 2005: The Hootenany in the Hills, Salem, MA. October 2005: The Red, Hot & Blue Rockabilly Weekender, Montreal, PQ, Canada. April 2006: Main Stage, Viva Las Vegas 9 Rockabilly Weekender, Las Vegas, NV. July 2006: Rumblers Nomads Car Show, Terryville, CT.